It has been decided by the competent authority that the Bureau of Immigration, Government of India will accept PIO cards as valid travel document till 30.09.2019 along with valid foreign passport and the Indian Immigration Check Post(s) will continue to consider all PIO cards valid for exit/entry into India till 30.09.2019. 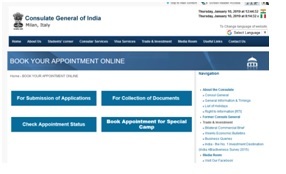 This extension of timeline is subject to the condition that if in the meantime any deadline is notified by the ICAO thereby making hand written PIO cards invalid, then PIO cardholders may have to obtain appropriate visa from Indian Missions/Posts abroad, if they have not converted their PIO cards to OCI cards. All PIO card holders are advised to apply for conversion of PIO cards to OCI cards, at the earliest. GENERAL PUBLIC IS HEREBY INFORMED THAT THE FEE FOR CONVERSION OF PIO CARD TO OCI CARD IS EUROS 95.00 + EUROS 3.00 TOWARDS ICWF WITH EFFECT FROM 01.01.2018.
International Civil Aviation Organization will accept only machine readable travel documents from October, 2018. The existing PIO cards, which are hand written, will, therefore, become invalid travel documents. Hence, it will be necessary upon PIO cardholders to obtain machine readable OCI cards in lieu of existing hand written PIO cards before October, 2018 to avoid any inconvenience.Those travelling to India on the strength of PIO Cards (handwritten) after ICAO’s rules/guidelines (with respect to travel with machine readable travel documents) come into effect from October, 2018, may not be allowed to board flights at the foreign airports, though they will be allowed entry at the Indian immigration counters. Please check the calendar of holiday of the Consulate( www.cgimilan.gov.in ) before taking appointment. The timings for submission of applications are from 0915 to 1230 hrs on all working days. The OCI cards are delivered between 0915 hrs to 1230 hrs at the Consulate counter. In case of any queries, please contact the Consular Section of the Consulate between 0900 hours to 1300 hrs or from 1400 hours to 1700 hours or mail to them at : hoc.milan@mea.gov.in OR consul@consolatoindia.in. Under Indian legal provisions, Persons of Indian origin (PIO) who have acquired Foreign citizenship on or after 01-06-2010 are required to submit declaration of renunciation of Indian citizenship and surrender their Indian Passports to the nearest Indian Mission/Post immediately. Those PIOs who became foreign nationals before 01-06-2010 are required only to surrender their Indian Passports to the nearest Indian Mission/Post and obtain a surrender certificate. The Indian Citizenship Act does not allow dual citizenship. Holding/acquiring Indian passport or traveling on Indian passport three months after acquisition of foreign citizenship constitutes an offence under the Passport Act and attracts penalties. In view of this legal provision all concerned foreign nationals of Indian origin applying for OCI card or other consular services are required to surrender their Indian passports (valid/expired) to the Consulate General of India, Milan. They would be issued an acknowledgement/surrender certificate in lieu of depositing their Indian passports. Applicants are requested to keep intact the renunciation/surrender certificate and/or the cancelled passport issued by the Consulate in their personal custody as a copy of the same has to be produced every time for availing any kind of visa/consular service. http://passport.gov.in/oci/OnlineOCIRegistrationG.jspand clicking on ‘Online Registration’. Validity of the OCI card is LIFE LONG. The OCI card comes with a stamp LIFE LONG. However if the applicant changes his/her foreign passport, he may apply and get a new OCI card by applying under OCI Miscellaneous services at https://passport.gov.in/oci/OnlineOCIMiscMain.jsp If the screen appears with the message ‘there is a problem with the website’s security’, please choose ‘continue to the website’. 1. Application for renunciation of Indian citizenship & cancellation of Indian Passport), pasting one recent passport size photograph. (CLICK HERE FOR APPLICATION) *2. 2. All the three pages should be filled in. As regards the second page (Form XXIV-Annexure-I), details of an Indian national and holder of Indian Passport should sign this form. 3. As regards Annexure-II (Form XXIV), should be neatly typed in CAPITAL LETTERS. PLEASE DO NOT APPEND SIGNATURE ON THIS. 4. Clear copies of the relevant pages of the Indian Passport (where the photo/name/date of birth, etc. appear, page where the names of parents and the page where endorsement has been made, if any).-SELF-ATTESTED. 6. In the case of minor children upto the age of 18 years, self-attestation should be done by atleast one of the parents and clear copies of the Passports (Indian as well as Foreign Passports) should also be submitted. 7. If the applicant is not applying for OCI card, but only for surrender of Indian Passport, appointment may be taken from :www.cgimilan.gov.in (For Submission of Applications>>> Miscellaneous Service). 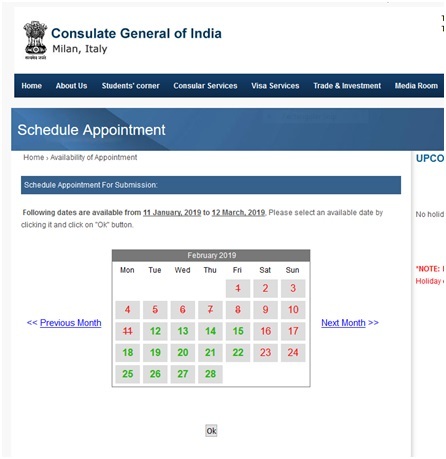 First step: Click on BOOK YOUR APPOINTMENT ONLINE ( www.cgimilan.gov.in ) and register yourself with correct details (Webfile/Applicant’s ID, Foreign Passport Number and Name). Applicants can take appointment only in the afternoon of the next working day of the Consulate, after registering. 1. APPLY ON-LINE at https://passport.gov.in/oci/capchaAction and upload the photograph and signature of the applicant, copy of the Foreign Passport (one page where the photo, name, date of birth, etc appear), copies of the relevant pages of the Indian passport (where the photo/name/date of birth, etc. appear, page where the names of parents and the page where endorsement has been made, if any) or the proof of being an Indian origin and marriage certificate, if the Indian passport does not have the spouse name endorsed in it. If the marriage was solemnized in Comune, Italy, the marriage certificate should first be apostilled from Prefutura and translation in English is mandatory to be uploaded. In case the marriage was solemnized in any other country, the marriage certificate should be attested from the concerned Indian High Commission/Embassy/Consulate. 2. Take the print out of the application form. 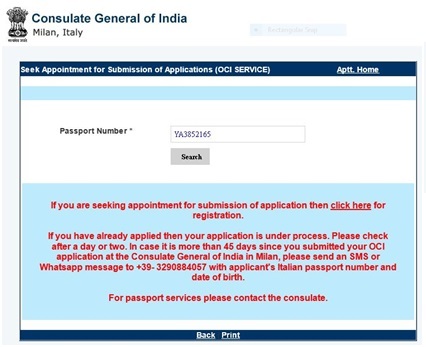 Please take appointment from our website :www.cgimilan.gov.in(for Submission of Application>>> OCI Card). Please paste one recent colour photograph of the size of 2 inch x 2 inch with light background on the first page of the application. The photograph should have a frontal view, showing both the ears. One photograph may be attached with the application form. 1. OCI Application form, duly filled in and signed by the applicant (signature should match with that in the passport). 4. Clear copy of the Marriage Certificate (SELF-ATTESTED), if married and if spouse name is not endorsed on Indian passports. In case the marriage was solemnized in Comune in Italy, the marriage certificate should be apostilled from Prefutura and translation in English is mandatory. In case the marriage was solemnized in any other country, the marriage certificate, in English, should be attested from the concerned Indian High Commission/Embassy/Consulate. 5. Copy of DECRETO regarding granting of citizenship issued by the concerned Foreign Government along with translation in English. 6. Copies of the relevant pages of the Indian Passport (where the photo/name/date of birth, etc. appear, page where the names of parents and the page where endorsement has been made, if any). 7. In case the Indian passport has already been cancelled earlier, copies of the relevant pages of passport where the photo/name/date of birth, etc. appear, page where the names of parents and address appear and the page where the Indian Consulate’s stamp appears with CONSEQUENT ON ACQUIRING OF FOREIGN NATIONALITY, THIS PASSPORT IS CANCELLED AND RETURNED TO THE HOLDER or the Renunciation Certificate-SELF-ATTESTED. (a) The marriage should have been solemnized at least two years before the date of submission of application for OCI card and the marital relationship still exists. Marriage certificate and copy (SELF-ATTESTED) should be submitted. Please not that if marriage was solemnized in Comune in Italy, the same should be apostilled/attested by Prefuttura and original as well as clear copy of the same along with translation in English should be submitted. In case the marriage was solemnized in any other country, the marriage certificate, in English, should be attested from the concerned Indian High Commission/Embassy/Consulate. (b) Further, the applicant and the spouse should give a joint affidavit stating that their marriage is still existing and that they have not got/sought divorce and that they are still living as husband and wife. Signatures on the Joint Affidavit should be done by both the husbands and wife in the presence of the Consular Officer at the Consulate. (c) In addition to the above, Birth Certificate, clearly mentioning the parents’ name, date of birth, place of birth, gender, etc, duly apostilled by Prefuttura, along with translation in English is also required. 2. Please upload the photograph, signature, copy of the Foreign Passport (one page where the photo, name, date of birth, etc appear), copies of the relevant pages of the PIO card (first page and last page and also any other page where any endorsement has been made, if any ), marriage certificate, if the existing PIO Card does not have the name of the spouse (husband or wife, as the case may be) OR the Indian Passport if it does nothave the name of the spouse (husband or wife, as the case may be ) endorsed in it. In case the Indian Passport has the name of the spouse endorsed in it, copies of the same may be uploaded. If the marriage was solemnized in Comune in Italy, the marriage certificate should first be apostilled from Prefutura and translation in English is mandatory to be uploaded. In case the marriage was solemnized in any other country, the marriage certificate should be attested from the concerned Indian High Commission/Embassy/Consulate. 3. Take the print out of the application form. Please take appointment (for Submission of Application>>> OCI Card).Please paste one recent colour photograph of the size of 2 inch x 2 inch with light background on the first page of the application. The photograph should have a frontal view, showing both the ears. One photograph may be attached with the application form. 4. Clear copies of the relevant page of the Foreign passport (SELF-ATTESTED)on all the copies.In the case of minor children below the age of 18 years, the self-attestation should be done by at least one of the parents..
5. Clear copies(SELF-ATTESTED) of the relevant pages of the PIO Card(first page and last page and also any other page where endorsement has been made, if any). In the case of minor children of below 18 years, the signature of at least one of the parents should be appended on all the copies. 6. Clear copy of Carta D’Identita (SELF-ATTESTED) In the case of minor children of below 18 years, the signature of at least one of the parents should be appended. 7. Clear copy of the Marriage Certificate – SELF-ATTESTED(if married),if the existing PIO Card does not have the name of the spouse (husband or wife, as the case may be) OR the Indian Passport does not have the name of the spouse (husband or wife, as the case may be ) endorsed in it. If the Indian Passport has the name of the spouse endorsed in it, copies of the same may be submitted (SELF-ATTESTED). If the marriage was solemnized in Comune in Italy, the marriage certificate should first be apostilled from Prefutura and translation in English is mandatory to be uploaded. In case the marriage was solemnized in any other country, the marriage certificate should be attested from the concerned Indian High Commission/Embassy/Consulate. (a) Marriage certificate and copy (SELF-ATTESTED). The marriage should have been solemnized at least two years before the date of submission of application for OCI card and the marital relationship still exists. Please not that if the marriage was solemnized in Comune in Italy, the same should be apostilled/attested by Prefuttura and original as well as clear copy of the same along with translation in English should be submitted. In case the marriage was solemnized in any other country, the marriage certificate, in English, should be attested from the concerned Indian High Commission/Embassy/Consulate. (b) Further, the applicant and the spouse should give a joint affidavit stating that their marriage is still existing and that they have not got/sought divorce and that they are still living as husband and wife. Signature on the Joint Affidavit should be done by the husband and wife in the presence of the Consular Officer at the Consulate. (c) In addition to the above, Birth Certificate, clearly mentioning the parents’ name, date of birth, place of birth, gender, etc, duly apostilled by Prefuttura, along with translation in English is required. 2. Please upload the photograph, signature, copy of the Foreign Passport (one page where the photo, name, date of birth, etc appear), copies of the relevant pages of the existing OCI card (first page and last page ), marriage certificate, if the existing OCI Card does not have the name of the spouse (husband or wife, as the case may be) OR the Indian Passport if it does not have the name of the spouse (husband or wife, as the case may be ) endorsed in it. In case the Indian Passport has the name of the spouse endorsed in it, copies of the same may be uploaded. If the marriage was solemnized in Comune in Italy, the marriage certificate should first be apostilled from Prefutura and translation in English is mandatory to be uploaded. In case the marriage was solemnized in any other country, the marriage certificate should be attested from the concerned Indian High Commission/Embassy/Consulate. 3. Take the print out of the application form. Please take appointment from our website :www.cgimilan.gov.in(for Submission of Application>>> OCI Card). Please paste one recent colour photograph of the size of 2 inch x 2 inch with light background on the first page of the application. The photograph should have a frontal view, showing both the ears. One photograph may be attached with the application form. 4. Clear copies of the relevant page of the Foreign passport (SELF-ATTESTED).In the case of minor children of below 18 years, the signature of at least one of the parents should be appended on all the copies. 5. Clear copies of the relevant pages of the existing OCI Card (first page and last page )-SELF-ATTESTED. In the case of minor children of below the age of 18 years, the signature of at least one of the parents should be appended on all the copies. 6. Clear copy of Carta D’Identita (SELF-ATTESTED) In the case of minor children of below the age of 18 years, the signature of at least one of the parents should be appended. 7. Clear copy of the Marriage Certificate – SELF-ATTESTED(if married),if the existing OCI Card does not have the name of the spouse (husband or wife, as the case may be) OR the Indian Passport does not have the name of the spouse (husband or wife, as the case may be ) endorsed in it. If the Indian Passport has the name of the spouse endorsed in it, copies of the same may be submitted (SELF-ATTESTED). If the marriage was solemnized in Comune in Italy, the marriage certificate should first be apostilled from Prefutura and translation in English is mandatory to be uploaded. In case the marriage was solemnized in any other country, the marriage certificate should be attested from the concerned Indian High Commission/Embassy/Consulate. If the marriage was solemnized in Comune, the same should be apostilled/attested by Prefuttura and original as well as clear copy of the same along with translation in English should be submitted. (a) Marriage certificate and copy (SELF-ATTESTED). The marriage should still beexisting. Please note that if the marriage was solemnized in Comune in Italy, the same should be apostilled/attested by Prefuttura and original as well as clear copy of the same along with translation in English should be submitted. In case the marriage was solemnized in any other country, the marriage certificate, in English, should be attested from the concerned Indian High Commission/Embassy/Consulate. 1. APPLY ON-LINE at https://passport.gov.in/oci/capchaAction and upload the photograph and signature of the applicant, copy of the Foreign Passport (one page where the photo, name, date of birth, etc appear), copies of the relevant pages of the Indian passport (where the photo/name/date of birth, etc. appear, page where the names of parents and the page where endorsement has been made, if any) or the proof of being an Indian origin, Relationship proof (copies of the relevant pages of the passport of parents, birth certificate, etc.). 3. 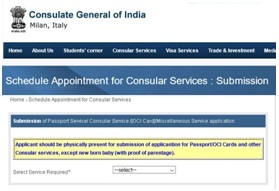 In the case of children, who have never held an Indian passport, please upload the birth certificate, duly apostilled from Prefuttura, along with translation in English and the copy of the OCI card and/or Indian/ foreign passport of one of the parents (SELF-ATTESTEDby either of the parent). 4. Take the print out of the application form. Please take appointment from our website :www.cgimilan.gov.in (for Submission of Application>>> OCI Card). Please paste one recent colour photograph of the size of 2 inch x 2 inch with light background on the first page of the application. The photograph should have a frontal view, showing both the ears. One photograph may be attached with the application form. 5. OCI Application form, duly filled in and signed by the applicant (signature should match with that in the passport). Both the parents should append their signatures (exactly as given in their OCI Cards/Passports) on the second page of the application. 6. Clear copy of the birth certificate(SELF-ATTESTEDby parents) issued by Comune along with its translation in English (in case the child was not issued any Indian passport), duly attested by Prefutura. 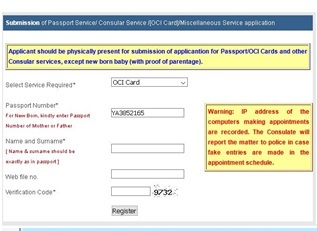 Please note that one of the parents should be an Indian origin and holder of OCI Card. 7. Clear copy of DECRETO regarding granting of citizenship, issued by the concerned department(Comune) along with translation in English (SELF-ATTESTED by at least one of the parents). 12. Clear copy of the Permesso Di Soggiorno of the parents, if one of them is holder of Indian passport(SELF-ATTESTED by the parent, who holds Indian Passport). 13. In case the Indian passport has already been cancelled earlier, copies of the relevant pages of the passport where the photo/name/date of birth, etc. appear, page where the names of parents and address appear and the page where the Indian Consulate’s stamp appears with “CONSEQUENT ON ACQUIRING OF FOREIGN NATIONALITY, THIS PASSPORT IS CANCELLED AND RETURNED TO THE HOLDER” (SELF-ATTESTED by either of the parent). 2. Please upload the photograph, signature, copy of the Foreign Passport (one page where the photo, name, date of birth, etc appear), copies of the relevant pages of the lost OCI card (first page and last page ), marriage certificate, if the lost OCI Card did not have the name of the spouse (husband or wife, as the case may be) OR the Indian Passport if it does not have the name of the spouse (husband or wife, as the case may be ) endorsed in it. In case the Indian Passport has the name of the spouse endorsed in it, copies of the same may be uploaded. If the marriage was solemnized in Comune in Italy, the marriage certificate should first be apostilled from Prefutura and translation in English is mandatory to be uploaded. In case the marriage was solemnized in any other country, the marriage certificate should be attested from the concerned Indian High Commission/Embassy/Consulate. Please also upload the Lost Report (in English) of the OCI card. 3. Take the print out of the application form. Please take appointment from our website :www.cgimilan.gov.in (for Submission of Application>>> OCI Card). Please paste one recent colour photograph of the size of 2 inch x 2 inch with light background on the first page of the application. The photograph should have a frontal view, showing both the ears. One photograph may be attached with the application form. 4. Clear copies of the relevant page of the Foreign passport (SELF-ATTESTED). In the case of minor children of below 18 years, the signature of at least one of the parents should be appended on all the copies. 5. Clear copies of the relevant pages of the lost OCI Card (first page and last page )-SELF-ATTESTED. In the case of minor children of below the age of 18 years, the signature of at least one of the parents should be appended on all the copies. 7. Lost Report (FIR, in original, as well as translation in English)-SELF ATTESTED. 8. Clear copy of the Marriage Certificate – SELF-ATTESTED (if married), if the lost OCI Card did not have the name of the spouse (husband or wife, as the case may be) OR the Indian Passport does not have the name of the spouse (husband or wife, as the case may be ) endorsed in it. If the Indian Passport has the name of the spouse endorsed in it, copies of the same may be submitted (SELF-ATTESTED). If the marriage was solemnized in Comune in Italy, the marriage certificate should first be apostilled from Prefutura and translation in English is mandatory to be uploaded. In case the marriage was solemnized in any other country, the marriage certificate should be attested from the concerned Indian High Commission/Embassy/Consulate. (a) Marriage certificate and copy (SELF-ATTESTED). The marriage should still be existing. Please note that if the marriage was solemnized in Comune in Italy, the same should be apostilled/attested by Prefuttura and original as well as clear copy of the same along with translation in English should be submitted. In case the marriage was solemnized in any other country, the marriage certificate, in English, should be attested from the concerned Indian High Commission/Embassy/Consulate. First step: APPLY, ONLINE, AND UPLOAD ALL THE REQUIRED DOCUMENTS. A Webfile Number is created, which is the Applicant’s ID. You can click on the available date (shown in green colour) as per your convenience.